The longtime Major League Baseball general manager covers the bases in a chatty memoir. 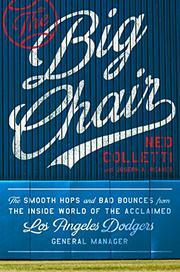 Alternating among declarations of his unabashed love for baseball, neutral reportage, and score-settling (usually with a smile and a subsequent peace offering), Colletti, whose career on the administration side covered decades with the Chicago Cubs, San Francisco Giants, and Los Angeles Dodgers, provides a variety of insights—among other subjects, about putting out fires as a GM accountable to a wealthy team owner, negotiating contracts with and making trades for players, getting a handle on illegal steroid use, and second-guessing field managers without seeming to interfere. The author, who began his career as a newspaper sportswriter, offers unforgettable, candid profiles of hundreds of players, including Greg Maddux, Barry Bonds, Manny Ramirez, and Yasiel Puig. Regarding the last, the immature, reckless behavior of players barely old enough to drink legally is a reminder of how much fans expect of athletes whose brains might not be fully formed yet. Superagent Scott Boras, a legend in his own time for his negotiating tactics on behalf of players, shows up in the text frequently, as do superstar players and managers that Colletti has hired and fired, a list that includes Joe Torre and Don Mattingly. Because the author grew up in the Chicago area, worked for area newspapers, and began his career with the Cubs, the book is larded with Cubs’ anecdotes, including the breaking of the century-plus curse to win the World Series in 2016. During his decade with the Dodgers (2005-2015), Colletti’s teams never won the World Series, but they finished strong during most of those seasons. The author could have broadened his memoir to discuss his mingling with celebrities beyond baseball, but he refrains from doing so except for a section about Frank Sinatra. A treasure trove of characterizations and insights bound to entertain any MLB fan.